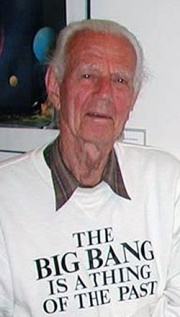 John Lowry Dobson (September 14, 1915 – January 15, 2014) was an iconic and legendary figure in astronomy outreach for the public as the co-founder of the amateur astronomical group, the San Francisco Sidewalk Astronomers, and for the Dobsonian telescope. Dobsonian telescopes revolutionized amateur astronomy because his design of a low-cost, high performance mounting system for Newtonian reflecting telescopes made it possible for amateur astronomers to build or buy affordable telescopes of relatively large aperture. The telescopes that John Dobson built made from wood, cardboard concrete forms, and porthole glass that he ground into telescope mirrors, made it possible for people in the urban environment to see deep sky objects. And for many city dwellers, it was the first time in their lives to see nebulae and galaxies with their own eyes through a telescope. Minor Planet 1999 KK4 (discovered on May 20, 1999 by James M. Roe at Oaxaca), was renamed to 18024 Dobson in honor of John Dobson whose simplified telescope mounting design revolutionized amateur astronomy.